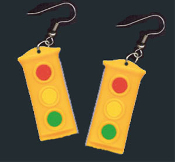 Big TRAFFIC STOP LIGHT SIGNAL ROAD STREET SIGN EARRINGS - School Bus Driver, Crossing Guard, Police Officer, Teacher Replica Novelty Costume Jewelry - Large Red, Yellow, Green, plastic stoplight charm, approx. 1.25-inch (3.13cm) Long. Red means STOP. Green means GO. Yellow means GO VERY FAST!